2016’s New Years Resolution One: Do the exercises in this book! I may have mentioned the book, Brag! 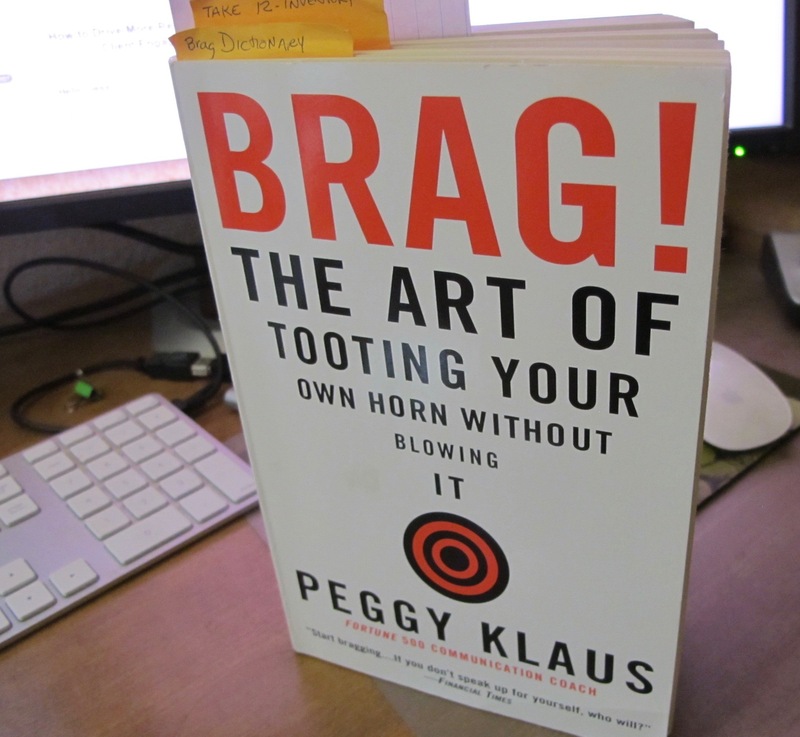 The Art of Tooting Your Own Horn Without Blowing It, by Peggy Klaus. It’s a great motivator for learning to talk well about yourself without becoming an obnoxious conversation hog. In her book, Peggy has a lot of exercises. For 2016, one of my resolutions is to work through as many of her exercises as possible. What better place to do that than on this blog? But these exercises aren’t just for me, I hope you’ll play along too. Are you ready? What? You say it isn’t 2016 yet? Hmm. You’re right. But I always did appreciate getting a head start on things. If you wait for the New Year, congratulations on your restraint. As for me, I’m diving in. Peggy talks about how important it is to build an ever-expanding repertoire of small speeches about yourself, she calls a BRAGOLOGUE. These can be 30-second elevator speeches or they can be up to three minutes long. If you think three minutes is a short amount of time, just try to talk to yourself in the mirror for three minutes. Yikes! It’s fun to be creative — bwa,ha,ha,ha,ha! Do you like to read mysteries? I do. I’ve read mysteries since I was in the second grade and read through the Happy Hollister stories, and moved on to Trixie Beldon and more. As a grown up, I not only read mysteries but I like to write them as well. I have two novels in print and am working on another. This summer, my second novel was released by Gale Cengage and Five Star Publishing. For my book launch, some writing friends and I decided to hold a “baby shower” for our new releases (did I mention I have some very creative friends?). At baby showers people expect to play party games, so our party was no exception. 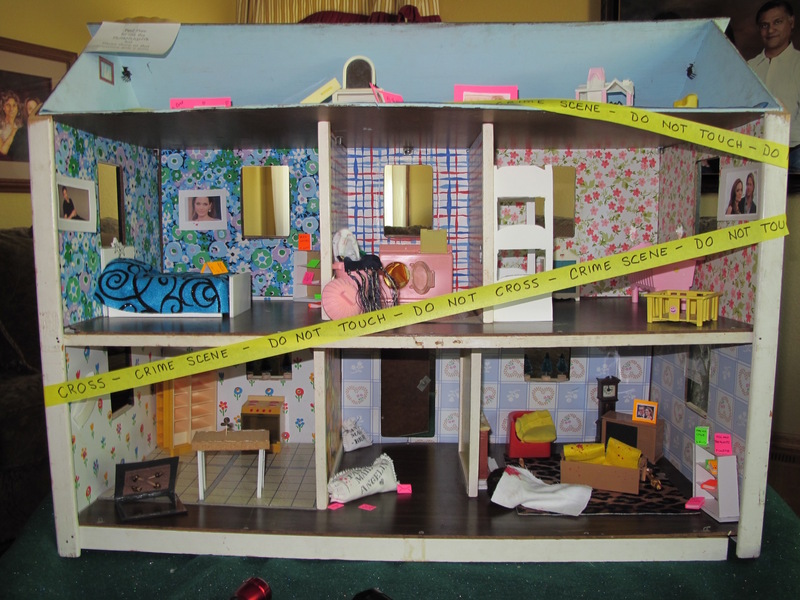 For my game, I found an old doll house and decorated it to be a murder scene. Good-bye Barbie, hello bwa-ha-ha! I gave my guests a sheet of questions so that they could play “You the Sleuth!” and test their powers of logic and observation. One of my guests had enough fun with this that she invited me to set up a life-sized murder scene for her Halloween party at a local dance studio. This made it possible to talk murder and promote my new book to more than 40 people. Can you take a personality gift of yours and write a small story about you? Start with a list of 5 personality pluses, and then narrow in on your favorite. Build a true story around it and start sharing with friends. I’d love to hear your story, so please do send it along. What are you proud of in yourself? What do people say when they’re trying to compliment you? And be sure to check out Brag! by Peggy Klaus. This should be on every person’s bookshelf. Wishing you a happy and creative writing day. This entry was posted in Bragging and tagged Brag! Tooting Your Own Horn, I'm creative so how is that interesting, Peggy Klaus by Liesa Malik. Bookmark the permalink.